It's adventure time, c'mon, grab your friends! 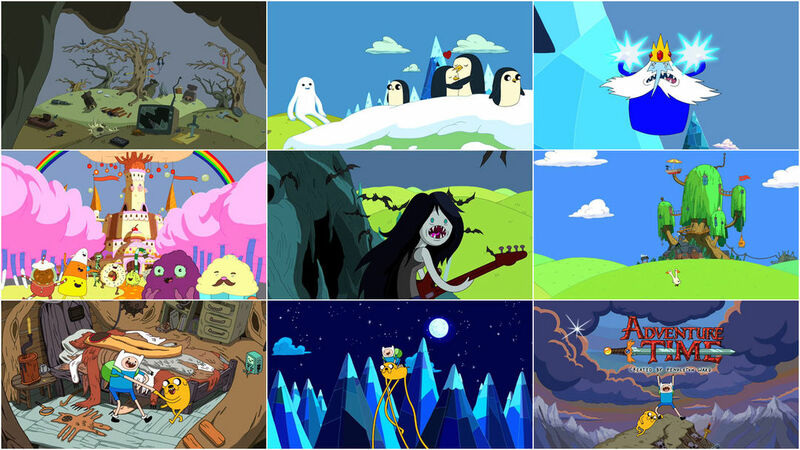 Through wood and wasteland, penguins cuddle at the outset of the wonderful Land of Ooo. 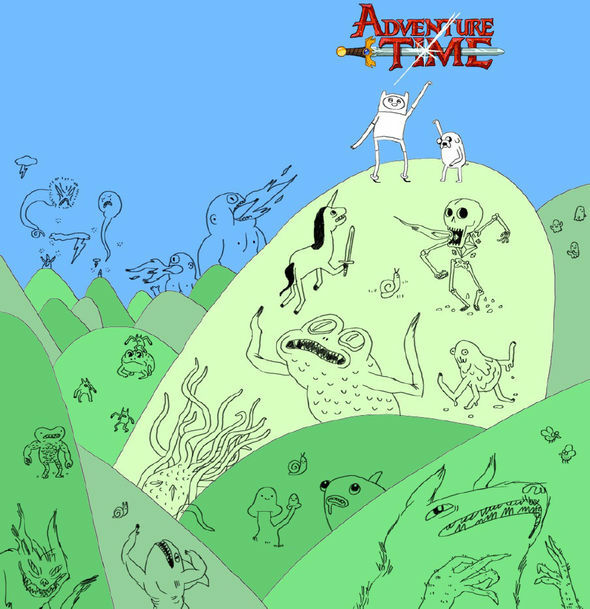 Pendleton Ward's cartwheel of an opening sequence to his Adventure Time series sports all the warm fuzzies of a My Little Pony rainbow and Conan the Destroyer's Atlantean Sword. The unaffected acoustic theme, which Pen also sings, establishes the fever dream folk tales that follow. This is a silly-smart world punctuated with noodle-armed pounds and a few scares by dint of – what else? – adventure. 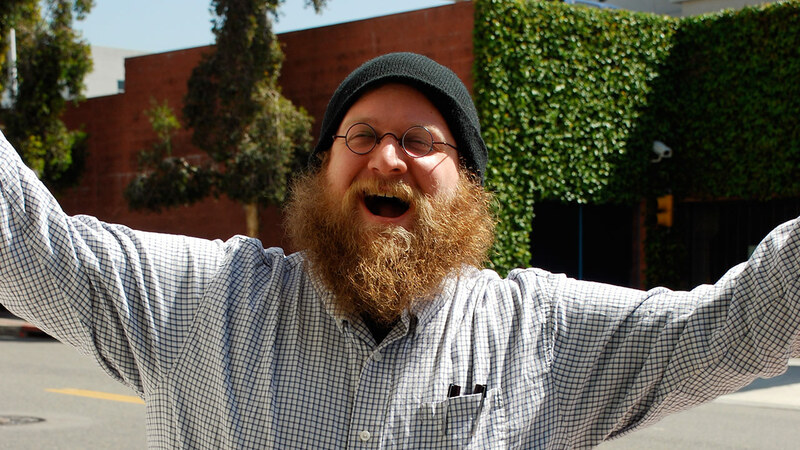 A discussion with Adventure Time creator PENDLETON WARD. Tell us your back story. PW: My mom was an artist and she had friends who knew about animation, so I've always been intrigued by animation. I started making flip books in elementary school and got my bachelor’s degree in character animation. 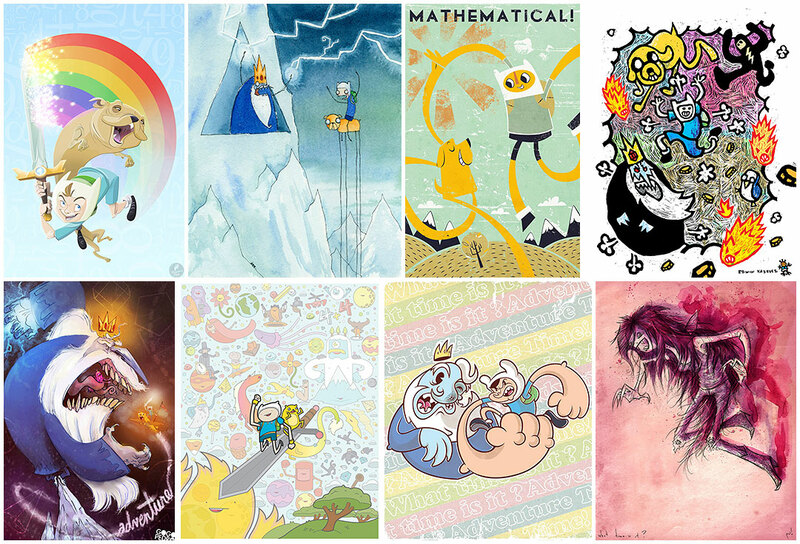 I pitched the Adventure Time pilot to Frederator right after I finished school at Cal Arts. That pilot was my first lead on a gig. It was nominated for an Annie Award, but no one had seen it because it hadn’t aired yet. As soon as they put it on YouTube, it went viral. Luckily, they took a chance on me! What was the evolution of the pilot? Nickelodeon came to Cal Arts and asked all of the students to pitch one minute long shorts to them, so I tried it out. 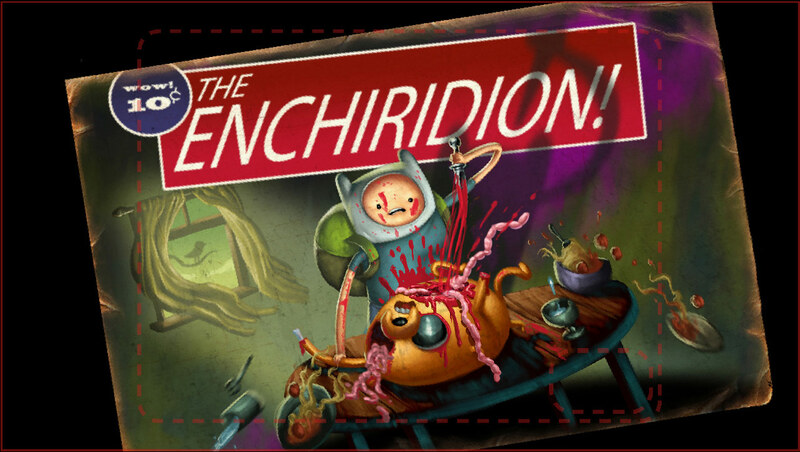 That was the very first incarnation of Adventure Time, that minute-long pitch to a couple of execs. They didn't buy it or even give me feedback on it. I don't think they really liked it. Then, after I graduated, I heard about Frederator doing their pilot program. At the time, I sketched a lot and was trying to find ideas to pitch. I saw Finn and Jake just sitting there – a kid with a bear hat and his bulldog riding on a boat – and I built the world around them and my initial sketches. I was on vacation with my family and boarded out a story, stream-of-consciousness style. It was just a boy and his dog living in a magical world where they save a princess – that, and other ideas I thought were funny. They did a series called “Random Cartoons” where they would ask people to come in and pitch them ideas whether they had industry experience or not. They were open to anyone and I did it and I was straight out of school. I think that's one of the coolest things about Fred Seibert and his company. They're always looking for fresh ideas. He's one of the smartest executives I've ever met. He takes a lot of risks, which is good. You have to do that to find interesting projects... that's why he's successful! So what happened after the initial explosion of the seven-minute pilot? We began pitching it to Cartoon Network over the next two to three years because it was sort of in limbo. During that time I spent a year as a storyboard artist on a show called The Marvelous Misadventures of Flapjack, also for Cartoon Network. 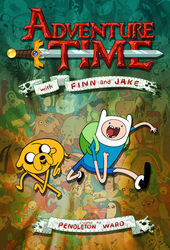 After a while, we heard that they picked up Adventure Time. Everyone liked the pilot, but no one understood what made it successful. A lot of people said it was charming and zany and full of weird ideas. Once it was picked up, I made two versions of the “bible” for the show where I tried to flesh out who the characters were and what they wanted. I added a couple of new characters – one character was Marceline the Vampire Queen – to make it a little more scary when we needed it. The bible contains character descriptions along with short episode synopses, details on what the land of Ooo is like, etc. It changes over time as the show evolves and as the characters get new quirks. This is partly due to the fact that each storyboard artist is also writing for the show. The show is storyboard-driven which means that there's a writing phase where we put together a three page outline with the two staff writers on the show and then give that outline to the board guys. 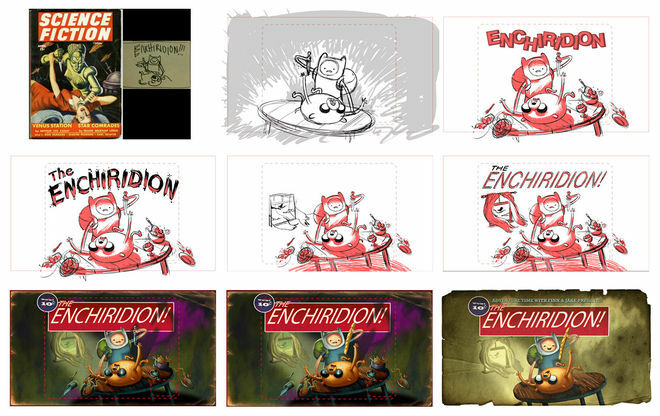 The storyboard guys write all of the dialog along with all of the storyboarding. In the end, each storyboard guy plugs his or her personality into the characters. 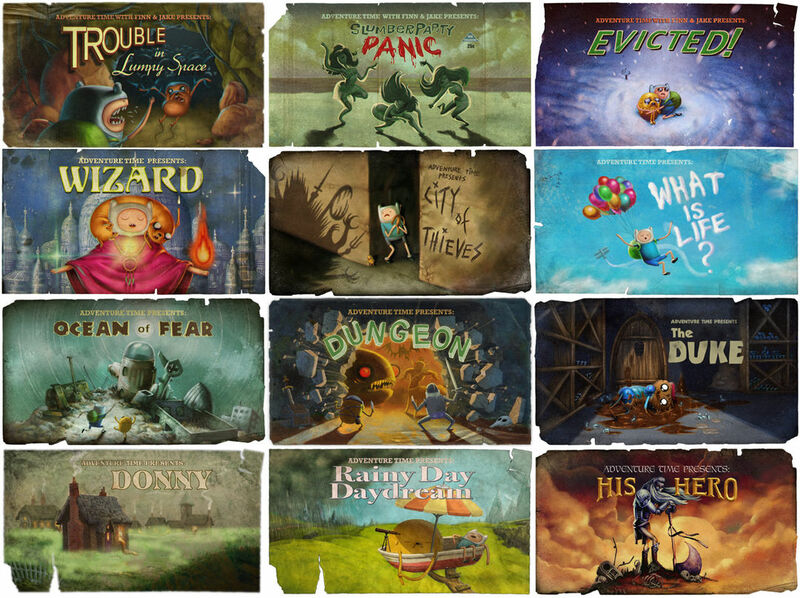 The opening title sequence is epic and each episode hits the personal notes of the ensuing lunacy of Finn and Jake; was this an idea adopted early on? The first pass of the title sequence was really quick and it was just sort of crazy, nonsensical adventure where the characters were just punching random ghosts and monsters, jumping through anything and everything... there were a bunch of atomic bombs at the end of it. It was really silly. I showed that to the network and their initial reaction was... they weren't totally stoked. From the start of this gig I knew I was going to be working with a lot of people and that anything that I wanted to do creatively could lead to some kind of battle, but I always felt that I was up to the challenge of listening to someone else’s notes. Part of that is being receptive to their notes and finding the best path to take while keeping the show funny. With the title sequence, their notes were asking for something more 'graphical' and maybe something Brady Bunch... similar to a lot of older title sequences that they liked. They also wanted to see more of the animated world. When I was a kid, I liked the intros to Pee Wee's Playhouse and The Simpsons because the initial sound to those is this “hhmmmMMMMM!” sound. That always got me really excited! It's like a pregnant pause in a conversation... it makes you hold your breath and I really wanted that kind of beginning. So I went back into the intro and did a terrible pass of rolling mountains and we handed that off to a layout guy and animator who really tied down the camera movement for us. Then I did the silly character stuff on top of his pass – the penguins kissing, the zombie hand coming out of the stump – and then pat McHale worked on the Ice King's “high school book” smile when he turns around. We also had Marceline in the shadows (because she burns) underneath the ruined highway and that was a big ordeal to get that right. When the title sequence was being worked on, how many episodes of the show had been completed? It was actually right before we aired. We were so close that we even debated about airing shows without the title sequence at the beginning. There's also a nice nod to Frank Frazetta's and Boris Vallejo's artworks. Yep, we pulled inspiration from Frank Frazetta for that end title painting. 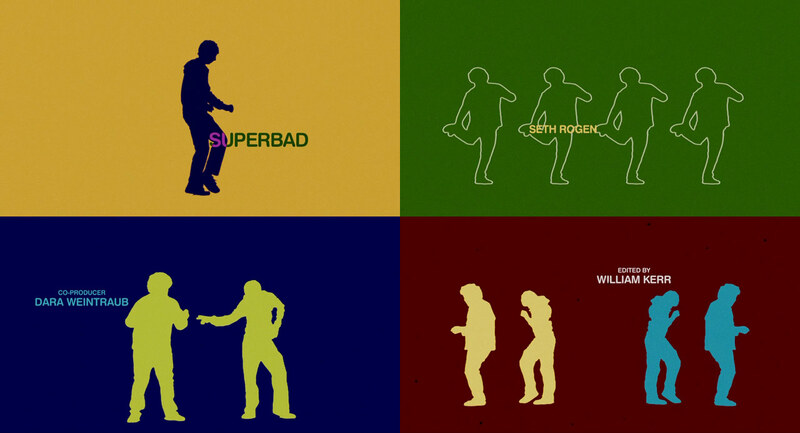 It was in the original pilot and we wanted to replicate that in the series titles. I'm a fan of Frazetta's works and you can see that throughout the show. Going back to the network’s desire for something more “graphical” ...obviously that can be interpreted in a number of different ways. 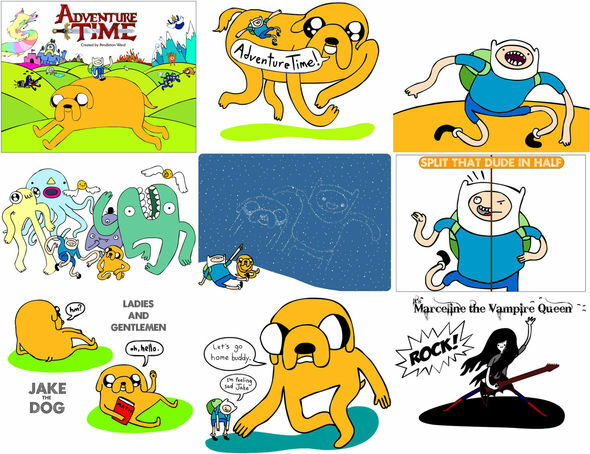 What it meant to me was using the words "Finn the Human" and "Jake the Dog" in the middle of it. At the time, I really liked the opening title to Superbad. I liked how simple it was with the flat colors and the silhouette. That's why the Finn and Jake title cards are the way they are. Tell us about the theme song. Well it's the same song we used for the pilot, just re-recorded with a different instrument. For the pilot, I recorded the song with a guitar, but for the series I used a ukulele. It sounds higher because I'm probably trying to match the ukulele. If you listen carefully to the recording, you can actually hear Derek Drymon typing on a keyboard in the bit when Jake is walking... a little clickity clack in that wide shot when his legs are stretched out. I recorded the lyrics for the opening title in the animatics room where we have this little crummy microphone JUST so that we could add it to the titles and submit it to the network. Later, we tried re-recording it and I didn't like it... I only liked the temp one! A lot of the music for our show has hiss and grit to it anyways because our composer is a cool guy and basically lives in a pirate ship he's built inside of an apartment. You can hear floorboards squeak and lots of other weird sounds. So how big is the production team? 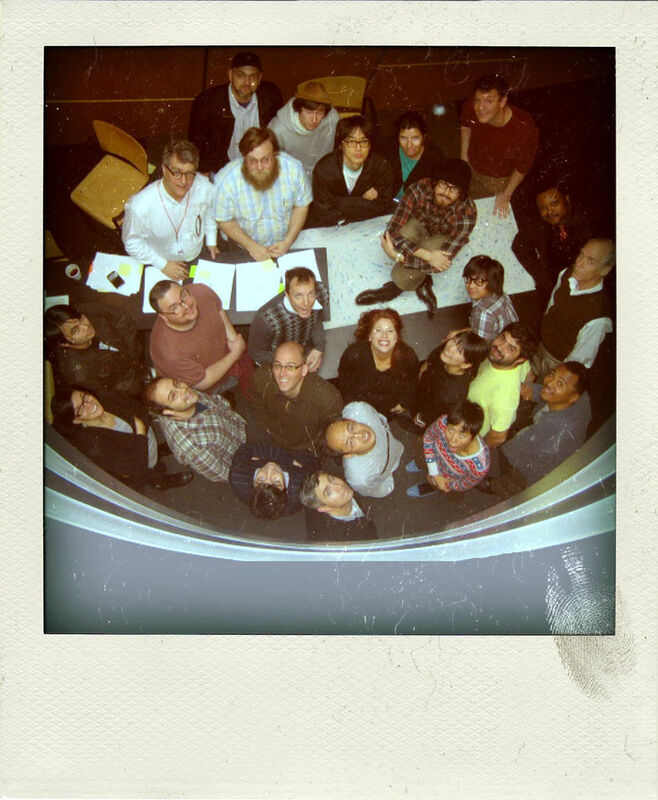 There's about 30 people on the crew here at Cartoon Network, not counting the execs. There's also two studios overseas doing the animation, so that's another 60 people in Korea. How does the approval and review process work for each show and how involved are you? I'm mostly involved in the story part of the show. Pat McHale is my creative director and he works with more of the visual side of the show with our awesome art director, Nick Jennings. They manage the backgrounds, the color, and the character design. I'm in the writers’ room during the outline phase and then I hand that off to the storyboarders. From there, they have one week to rough thumbnail a storyboard and then Pat and I go in and give notes. After that, they have another week to implement our notes. It takes two weeks to clean up, so it comes out to four weeks altogether for each storyboard and we're involved every step of the way. For the first season I was rewriting a lot, but I've let go of a lot since then. There are a lot of really talented dudes and ladies working on the show, so the board guys are more in control of their episodes now. So does everything go through you? You mentioned being more relaxed with the production process now. (laughs) If I'm not satisfied with something, I'll revise it; right now, I'm really happy with what everyone is doing. I go to all the voice recording sessions and I do post-production and sit with the animatic guys. I'm still really involved with every step of the process. Is it hard to tiptoe around the PG rating? No, not really. I want to create children's television because it affected my life so intensely when I was a kid – watching Ren & Stimpy and The Simpsons – it just rocked my imagination. I want to make stuff that kids get stoked on. I've never really even thought about the rating. We just do whatever we want to do and so far... we haven't really hit any snags. Pat and I... we don't like stuff that's overly gross. We like cute stuff and nice things, so we try to plug the show full of that. 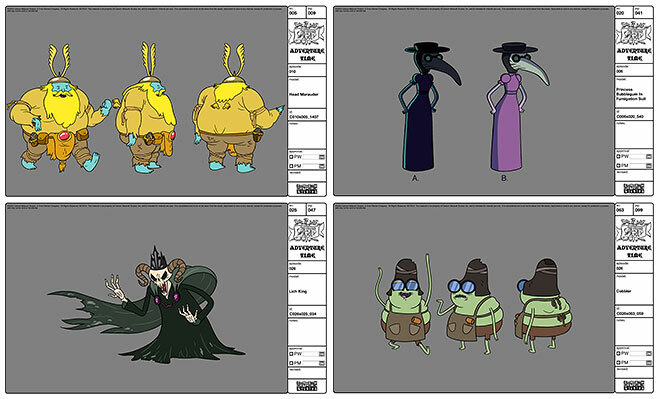 I mean, there is a lot of gross weirdo stuff in the show, but only because there are so many voices. When something gets too sick, Pat usually gets grossed out and then I revise it, or we think about how we'd react when we were kids. You mentioned that it took a couple of years before the show was picked up. How did you sell it? What was your strategy in explaining who the target audience was, etc? The show didn't really have a tagline or catch phrase that could sum it up. It was really just these two buddies that hang out in this magical world, which obviously was important to me, but it wasn’t a really strong selling point. (laughs) I was just stumbling through the process and trying to be as genuine with it as I could. I don't know how it happened. It was just a blur of me taking notes on what I thought they would want while trying to make sure that it stayed cool and fun feeling. Tell us about the episode title cards. There seems to be an enormous amount of detail, care, and love in each one. We were initially thinking about getting a bunch of different guest comic artists to create them. I started emailing with Paul Pope who had heard about the show through our background designer Ghostshrimp and we were talking about Paul doing a couple title cards. That ended up being too difficult to organize. We didn't go through with it, so I ended up just brainstorming with Nick and Pat. We all like pulp comic covers, mysteries, and detective stuff, so Nick sort of ran with it. He's a weirdo and collects all of this old paper... he scanned in this vintage paper to use as the borders of the title cards. A bunch of people worked on them – we just like that stuff so we ran with it. I'll do an initial sketch of what I was thinking for each episode on something like a Post-it note and then I give that to Phil Rynda who is our lead character and prop designer. He does a really nice tied down drawing of it and then we send that to Paul Linsley. Paul is the artist who painted the original “Frazetta style” title cards for the pilot. He does the painting and then hands them to Nick Jennings who usually goes over them and maybe changes colors here and there. He manipulates them a lot. He adds the final dithering process that mimics old comic book print. You can't even detect all the detail watching in HD. Will you continue with the same format for the next season? Yeah, it's the same feeling. I like consistency unless it's funny to break out of it... but I like what we're doing right now. The social aspect of the series is very prevalent. You seem to have an amazing connection to your audience – tell us about this. Fred is the mastermind behind all that. One philosophy of his is putting the content out there for fans to become invested in. That's how we create the fan base. Much to the dismay of most of the crew, he takes everyone's stuff and puts it out there – putting up rough ideas that aren't even finalized! He puts it all up. It's cool because it's crazy... he does things that no one else is doing. I like that chaos. I like posting the stuff too, because I like seeing how people respond to it. I check all the forums; I read everything. I like to post stuff if I think people are going to get stoked on it. I like the “social experiment” of having a television show that'll be entering the minds of both children and adults across the nation. I like how that is going to affect everyone. I grew up being a fanboy for The Simpsons... I know Krusty the Clown's middle name is Shmoikel and... I was always excited to find out more about the creators of the stuff that I liked, so I like being in that position now... the position to give people who like the show that kind of stuff. I know where they're coming from. So when I'm talking to fans at, say, ComicCon, I know what's going through their head. It's fun to be as friendly as I can be and to put out as much stuff as possible... As a fan, I know that’s what I would want. HELP ART OF TITLE KEEP ON TRUCKIN'. BECOME A PATRON TODAY.